The first time I saw the daffodils blooming by the side of the road was well over 25 years ago. My mother-in-law and I were heading home after a day of shopping when she suddenly veered off the main highway to show me something I’d never seen before. We traveled about a mile down a one-lane gravel road before turning to the south. And there, in full abundance, was a riot of sunny yellow daffodils, blooming along both sides of the road, as far as the eye could see. She didn’t know the story of who had planted them or why, but she’d come across them years ago and thought I’d enjoy seeing them. I hadn’t been back that way for years, but I did think of those amazing roadways every spring. Then, last week, as I noticed the bulbs beginning to bloom in my garden, I decided to see if those dancing daffodils were still there, and there was only one way to find out. Armed with my camera, I headed off, hoping I’d remember where to turn. 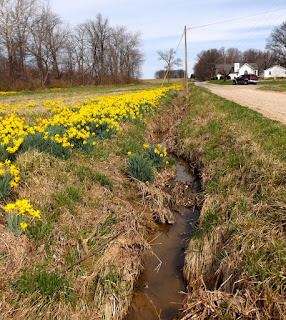 In fact, I did recognize one of the routes, and there at the intersection of two country roads were the daffys; bright yellow, swaying and bobbing in the breeze, a happy harbinger of spring. 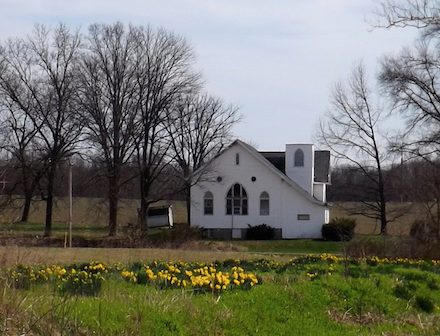 Once again a riot of yellow blooms spread along the road, ending down by a house to the south, but heading off toward a church and more roads to the north. Beautiful and uplifting! I did some digging and finally discovered the story behind the daffodils from Jo Gardner. Jo’s parents, Ed and Lois Whittaker decided back in the 1940s that they wanted to make the countryside look pretty during these wet, muddy spring months, so they began a two-person campaign to beautify their country neighborhood. They began planting daffodil bulbs. 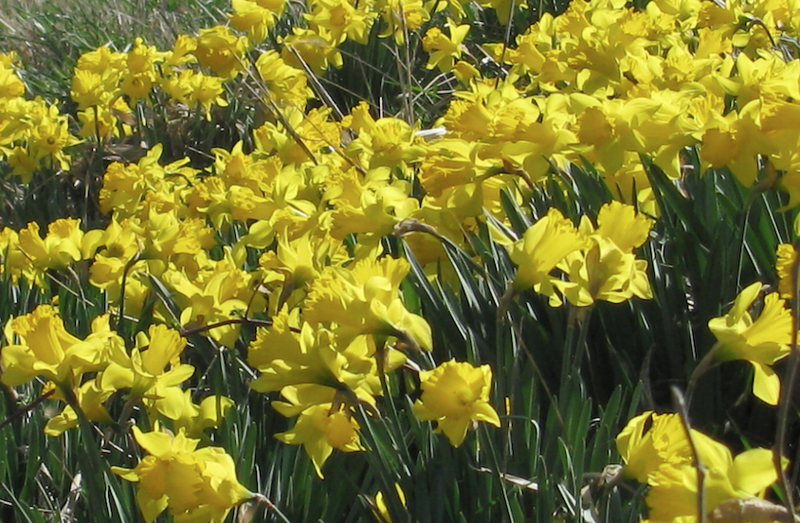 Each year, they planted more bulbs, and each year the back country roadways heralded in spring with the uplifting glow of yellow daffodils. Jo said that her dad, Ed would take a spade and make a hole, then her mom would drop in the bulb, and Ed would step on it to cover it up. Jo isn’t sure where all of the bulbs came from. People began donating them, some bulbs were divided, and sometimes the plants just spread themselves across the countryside. Once the Whittaker’s had planted their roadside, they branched off to the north and south, lining the roads that led to the Pleasant Ridge Church. Word spread of the spectacular flowers and people drove the roads to see the beauty. Jo doesn’t know why daffodils were her parent’s flower of choice, but folklore may shed some light on that. In Victorian times, flowers had meanings – there were actual flower dictionaries with the meaning explained. According to one description, the bright yellow daffy indicated love, regard and respect. It was also a symbol of hope, joy and new beginnings; the perfect flower for spring, which brings us a new beginning each year. 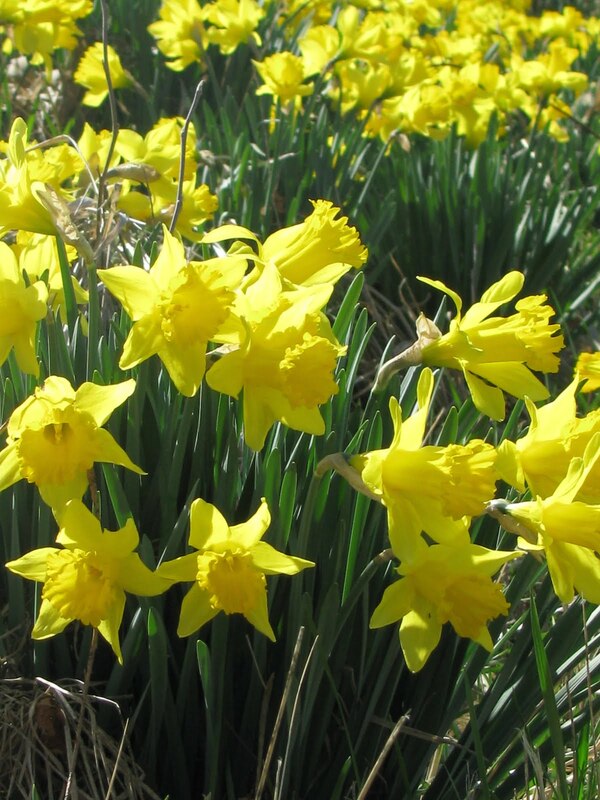 The daffodil is also a symbol of rebirth, and associated with the spring festivals of Lent and Easter. While we in the U.S. call them Easter Lilies, in Germany they are known as Easter Bells, and in England as the Lenten Lily. Jo said that her father planted the last of the daffodils in 1989, at the age of 94. The Whittaker’s life-long dedication to making their ”little corner of the world” more beautiful is a lesson for all of us. Regardless of how busy we are, there’s always time to brighten a little piece of our world, and that, in turn, may give joy to others. Thanks to the Whittaker’s, the feelings of happiness and joy bubble forth over 70 years later at the sight of those golden daffodils dancing in the prairie breeze each spring, along the gravel roads of Lawrence County, Illinois. What a beautiful legacy to be remembered for!